Design Sprints are gaining in popularity, as more and more people are discovering how quickly you can take an idea – old or new–, create a prototype and validate it. 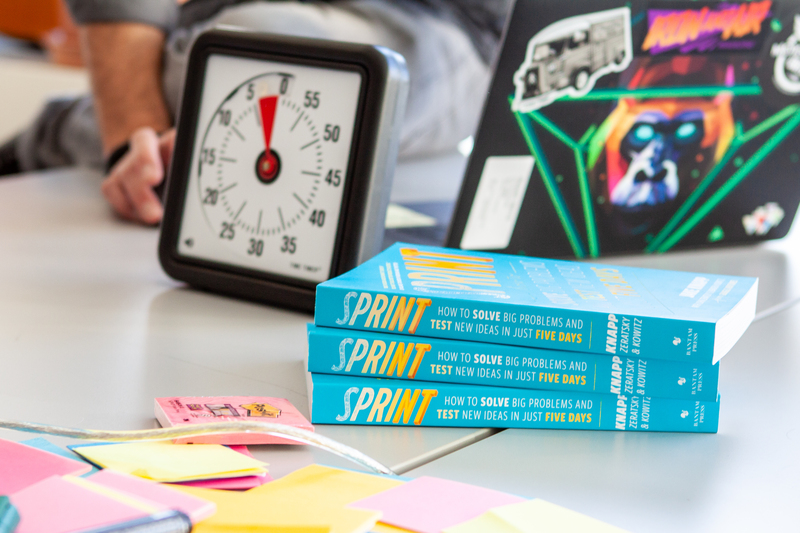 With the introduction of Design Sprint 2.0, the time to execution is faster than ever: 4 days for the core team, and 2 days for key stakeholders to participate. Recently, I facilitated a Design Sprint at a HEMA, aimed at making locating a product in a store easier for customers. Our team consisted of a store manager of HEMA, the decider, and two Hike One designers, plus myself as a facilitator. At Hike One we have facilitated over 70 Design Sprints and gathered many useful tips. For all facilitators about to facilitate their first Design Sprint, I like to share these 5 tips. Personally, I like bing well-prepared and a first step is to read Sprint, by Jake Knapp. While this book describes the 5-day program, a lot of the program is unchanged and the book s contains many interesting examples. If you are working with Sprint 2.0, dive into the materials that AJ & Smart generously provide on their website. Extra tip: the night before the sprint, I like to revisit key parts of the book to make sure I’m absolutely familiar with the next day’s program. More of a listener then a reader, like some of my colleagues? Try listening to the audio format of the book. This is when I explain that although we are on a tight schedule, we can finish everything in only four days without having to order pizza. This means we have to be disciplined and stay on course, otherwise, I interfere. I also show the team the Time Timer and explain that I time every activity. I introduce the Decider to the group and ask if the group is okay with this choice. I explain the role of the decider: As a team, we are all responsible for coming up with great ideas, but in the end, this person has the final say. I state this in my invitation email and repeat it again on day 1: devices are not welcome in the sprint room. I ask the team if it’s okay if I enforce this rule as a facilitator. My advice is to set an out-of-office message during the Design Sprint. During breaks you can use your device as you wish, or step out of the sprint room at any time. My favourite ‘rule’: I show everybody the right way of pealing a post-it, to prevent notes whirling down at the end of the week. How to do it? Hold the stack of notes in your hand and pull the top post-it downwards. This prevents the paper from curling. People seeing it for the first time are usually mind-blown. This is also when I mention a few more tips related to Post-it Notes. For me, this one is the most important for my own peace of mind. Maybe it's the perfectionist in me. The outcome of the design sprint is not your responsibility, it’s the team’s. Your role as Facilitator is to guide the process and enable the team to come up with great ideas. This means that you don’t participate in sketching, or cast your vote, but do challenge the team with questions or remarks. You can make an exception on Prototyping day, when you can help the team get stuff done. What I like most is seeing the surprised reactions of the team: Proud of the work they accomplished and inspired by everything they learned about the target group and the solution. 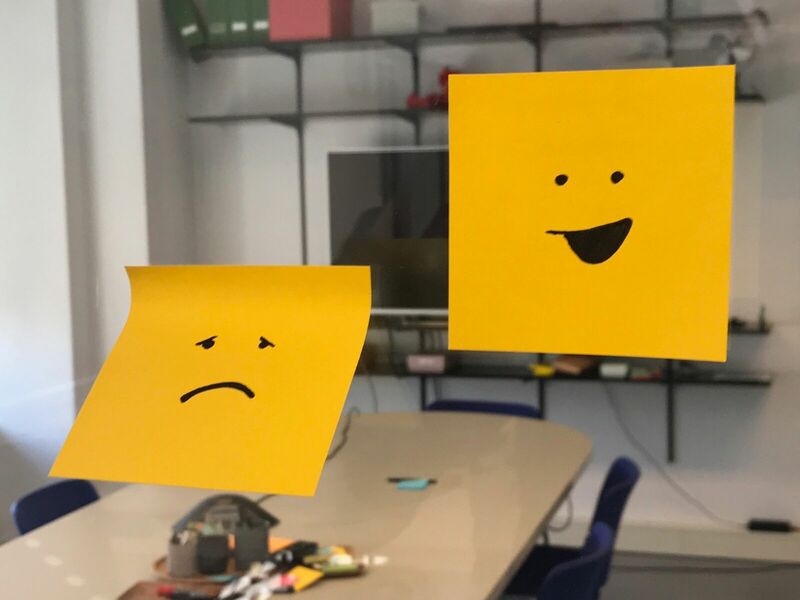 A Design Sprint really boosts the energy of the team. Treat this week as a mini-holiday away from your regular job, and enjoy it! Don’t forget to celebrate your succes by sharing a meal or grabbing drinks with the team. The Design Sprint for HEMA was a succes and not only delivered a tested prototype, but brought us a lot of insight in behaviour and views of customers. As Hike One has hosted over 70 design sprints, I’m lucky to have the support of my colleagues. I hope my tips will come in handy for your Design Sprint. Need more tips and tricks? Be sure to check our the trainings we offer. This blogpost has previously been published in Dutch on Emerce.